Back when I played through Alan Wake I heaped on the accolades. It redefined interactive storytelling, I wrote. I said it likely won't be topped in 2010. Enter now the final chapter in this brave experiment of blending the interactive nature of video games with the compelling hooks of episodic must-see-TV. The Writer is the second episode for the game, a sort of season finale, and like television it faces high expectations. There are unanswered plot points to deal with, character back stories to plumb, and the need to deliver final proof that gamers should plunk down full fare for the next full game expected from the series. This is pretty straight forward: The writer is meant to be the last episode of narrative-driven thriller Alan Wake for the Xbox 360. You can't play this download add-on without Alan Wake and you wouldn't want to. It would be like reading the last chapter of a confusing book. Alan Wake was a video game driven by a compelling story, interesting light and dark mechanics and the promise of television-like episodic content. The Writer essentially wraps up this game's first season. Any desire to buy into the second season will be driven by this finale. How did The Writer compare to The Signal and the main game's story? While there's a bit more plot to be found in The Writer than there was in The Signal, it's still disappointing compared to the character development and strong narrative of the original game. The Writer drifts over old ground and delivers neither a meaningful conclusion to the solid story found in the original game nor the sort of nail-bitter that leaves you hungry for the inevitable boxed sequel. Is there anything new in The Writer? Not really. The game has some interesting settings, some neat fun-house level design, but no new mechanics, no new characters and not much in the way of satisfying plot. What if I don't own Alan Wake, is it worth picking up the game to play it and both extra episodes? When I finished playing through Alan Wake I wrote that it was a strong game of the year contender. I would still feel that way if it wasn't so inexorably anchored to such mediocre addenda. The problem is that you'll feel committed to getting those add-ons once you finish the game because, as weak as they are, they still inch the plot forward. That added commitment to lackluster content makes it a bad deal. Now that the "season" is over, what do you think of the concept of episodic gaming as seen in Alan Wake? I love the notion of playing a game the same way you view television, one sensible hour at a time delivered over the course of weeks. Had developer Remedy delivered extra episodes as powerful as the original content it could have proven the power of that method. Sadly they did not. If this were a TV show I suspect it would face cancellation. This video contains story spoilers from the original game and a glimpse at a lot of settings and gameplay elements for The Writer. The Writer is a disappointing, anti-climactic end to a full-budget game experiment that had high potential. The first downloadable episode, The Signal, was disappointing, but I assured myself it was mostly-free filler meant to tide us over until this final episode hit. I was wrong. Looking back at the narrative structure of Alan Wake and its paid-content offspring, it looks like what Remedy has been selling us is a particularly flat and vapid deneouement as they prepare to launch a boxed, and much pricier season two. 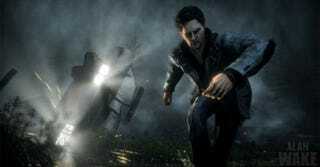 The Writer episode of Alan Wake was developed by Remedy Entertainment and published by Microsoft Game Studios on Oct. 12 in North America. Retails for 560 Microsoft Points, or about $7. A code for the DLC was given to us by the publisher for review purposes. Played through the entire episode.